The first annual Pro World Championship Singles and Doubles took place April 18-22 at the Sands Regency Casino Hotel in Reno, Nevada. Nearly every top rated player was on hand, providing five days of intense and exciting competition. One of the highlights for everyone in attendance were the boards. Having another six months to cure since they were used at the NASC last fall, the boards played exceptionally well. Being that the dates for the WCT were announced only six months prior to the event, we were not sure what kind of response the tournament would get. As it turns out, the event went very well. Both events were close to full and we are confident that the 2002 event will be even better. The dates for the 2002 WCT are April 2-7. Players that entered the tournament this year will have the first opportunity to enter the 2002 event. The one disappointment was that there were not as many spectators as we expected. Those that did show up to watch had the opportunity to play on two action boards that were set up in the next room. There was also a warm-up board for tournament players to throw weights on. Next year, in an effort to increase the spectator turnout, there will be four action boards set up and some type of tournament (probably a draw partners) for those who come to watch the main events. 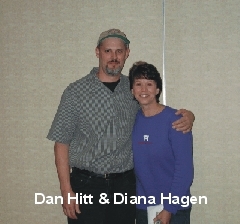 As far as the tournament action goes, it was the team of Diana Hagen and Dan Hitt prevailing in the Open Doubles, going through the tournament without losing a match en route to victory. They beat the team of Darrol Nelson and Dan Hitt in the finals to claim the title. 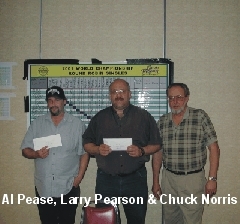 Third place went to John McDermott and Bill Melton. In the Round Robin Singles, there were 21 players, meaning that everyone played 20 games. 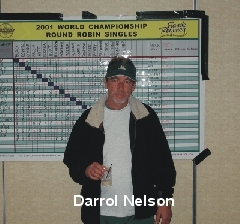 Coming out on top was Darrol Nelson, with a record of 17 wins and 3 losses. 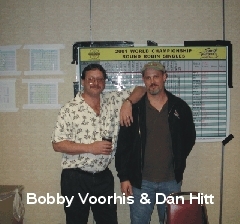 Tied for second/third place with 14 wins and six losses were Dan Hitt and Bobby Voorhis. There was a three way tie for fourth/fifth/sixth. 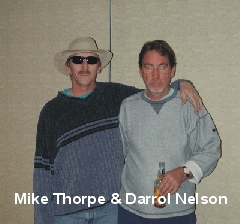 Those spots went to Chuck Norris, Larry Pearson and Al Pease with 13-7 records. John McDermott finished seventh with a record of 12-8. Rounding out the top ten were Diana Hagen and Hal Perry who finished 11-9. Although Darrol pulled away from the rest of the field on the final day, fourteen of the remaining nineteen players were in contention to finish in the money going into the final three rounds of play. When it was over, the players were enthusiastic about the way the tournament went and were already looking forward to next year. Because those who participated this year will have the first opportunity to play in the 2002 WCT, there may be only three spots open in that event. Visit the Tournament Information section of our web site often for all the latest information.